The NDTV report on Zakir Naik being arrested and bound to be deported to India made the rounds of the globe on Wednesday. But the NDTV network is taken aback with a slap after its report of the arrest and deportation of Zakir was denied by the Malaysian Prime Minister Tun Dr Mahathir Mohamad. NDTV’s video is widely circulating on social media, with many people believing that Zakir Naik was indeed arrested and is being sent to India. TISG reported that Naik has denied reports that Malaysia wanted him out of the country. However, Dr Mahathir made it clear to Zakir: Behave and you will not be deported! Mahathir said as long as controversial Indian preacher Zakir Naik behaves himself, the Malaysian government will allow him to stay. The flimsy reason Mahathir gave was that he has permanent residency in the country, as such he is to be treated as a citizen in some ways, which is good news for Zakir. “As long as he is not creating any problem, we will not deport him because he has permanent resident status,” Dr Mahathir Mohamad said at a press conference today. He was speaking at Yayasan Perdana in Putrajaya after a Pakatan Harapan presidential council meeting. 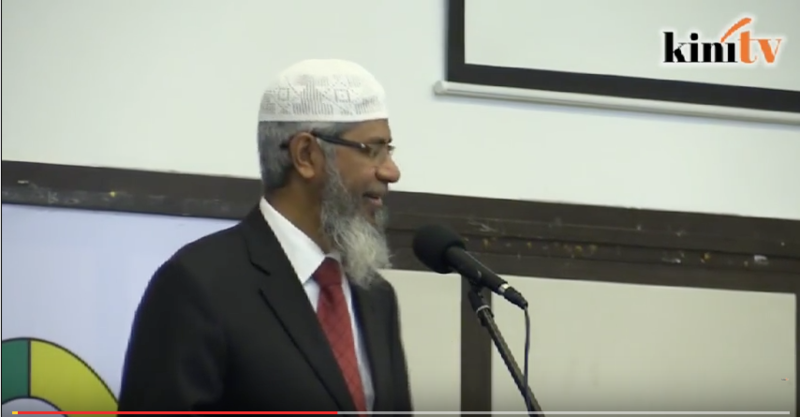 It was reported yesterday that the Indian Foreign Ministry had confirmed that a formal request has been made to Malaysia for the extradition of Zakir. Ahead of the crucial elections in Malaysia, Zakir Naik was heard on multiple occasions giving his full support to ex-PM Najib Razak’s government. The Najib government was then plagued by numerous scandals, including the massive global kleptocracy money laundering affair called the 1MDB. Under the 1MDB, the Najib regime syphoned billions of dollars which were transferred from Malaysia via several offshore accounts in various jurisdictions. Zakir’s support to the Najib regime caused the ire of a majority of Malaysians who wanted him to be deported to India. This played into the hands of anti-Zakir groups within Malaysia and with the arrival of the reformist regime in Putrajaya, pressure mounted on the Dr Mahathir government to deport Zakir. A wing of the government had probably thought Dr Mahathir will abide by their request of deportation of the controversial preacher. This wing of the Pakatan Haparan regime thought it was all decided when India made a formal request to the Malaysian government to extradite Naik to India. But Dr Mahathir and other top leaders of the Pakatan had a different view on Zakir. They decided he should stay, but only if he behaved. The Indian foreign ministry is reported to have confirmed that a formal request has been made to Malaysia for the extradition of controversial preacher Zakir Naik. Foreign ministry spokesman Raveesh Kumar told reporters at a weekly media conference that New Delhi had made a formal request for Naik under an extradition treaty with Malaysia, said the Malaysian site Free Malaysia Today. “At this stage, our request is under the active consideration of the Malaysian side. Our High Commissioner in Kuala Lumpur is in touch with Malaysian authorities,” he said in a video recording provided to FMT by the satellite news channel Republic TV. The Hindu newspaper and the Times of India also reported that the extradition request was made in January and the Indian government had pursued the matter through diplomatic channels, FMT reported. Naik’s support of the Najib regime has cast doubt on his credibility. Najib is now facing four counts of CBT (Cheated by Trust – 3 times) and abuse of power. He was arrested on Monday and was presented to the courts on Tuesday. He was released on Tuesday after he posted half of a RM1 million bail. He has until Monday next to pay the rest of the bail money, or he will face jail. The 1MDB scandal is said to be the biggest money laundering scandal in human history, involving US4.5 billion to the least, said the Swiss Attorney General. The U.S. Department of Justice or DOJ is also pursuing the case against the 1MDB calling it the biggest kleptocracy and money laundering scandal in the world. Najib has denied any wrong doing in the 1MDB scandal. He lost the May 9 elections mostly due to his mishandling and his government’s attempts at coverup of the scandal.